When I left off with our remodel saga last, we had just finished the demo portion of the project. Steve was nice enough to crawl around in the back of closet, cleaning up all the grit and dirt and icky leftover demo debris. … is NOT the correct way to run NM through a stud! I used a few nail plates to correct the issue as best I could. At least I won’t have to worry about electrocuting myself while hanging drywall! 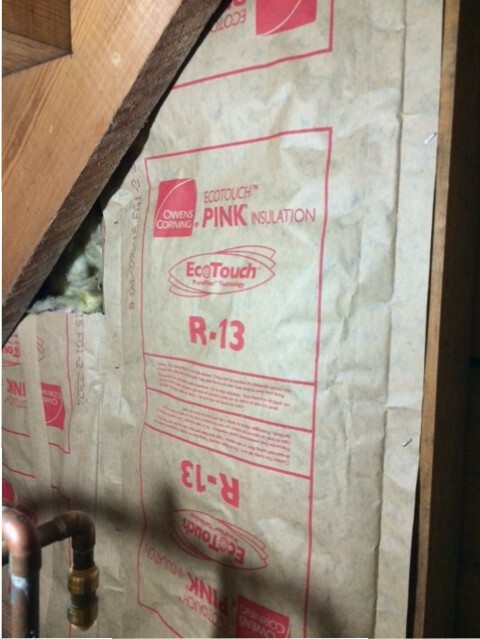 For our first foray into insulation installation, we selected Owens Corning EcoTouch R-13 Faced 2×4 Wall Insulation. It comes in a big pink roll, with the Pink Panther on the front, which makes me happy. 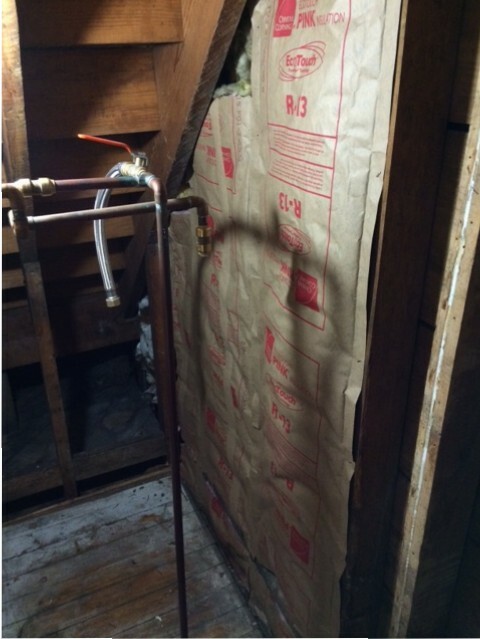 What made me even happier, though, was how easy this insulation was to install. The Owens Corning site and the Home Depot site both have nice videos about how to properly and safely install the insulation, which I referred to before attempting this part of the project. I suited up in Tyvek coveralls, a dust mask, goggles, and a hat, just to be on the safe side, and got to work. We measured the lengths that we needed for the closet, then rolled the insulation out on the front porch, faced side down, fluffy side up. 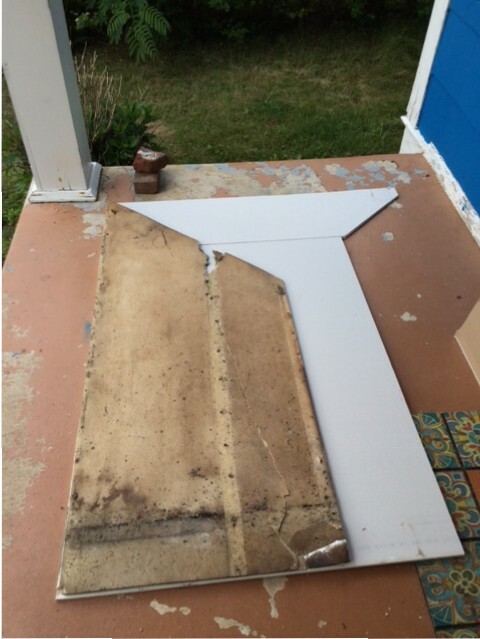 I measured out each length, then placed a piece of scrap wood across the insulation where I wanted to cut, pressed down, and cut it with a utility knife. I had a little trouble cutting through the facing, but I think that was due to the utility knife and not the insulation. We took each cut piece of insulation into the house a placed it in the wall cavity, being careful not to compress it or crush it. The insulation has little paper tabs on each edge that fold out over the stud. 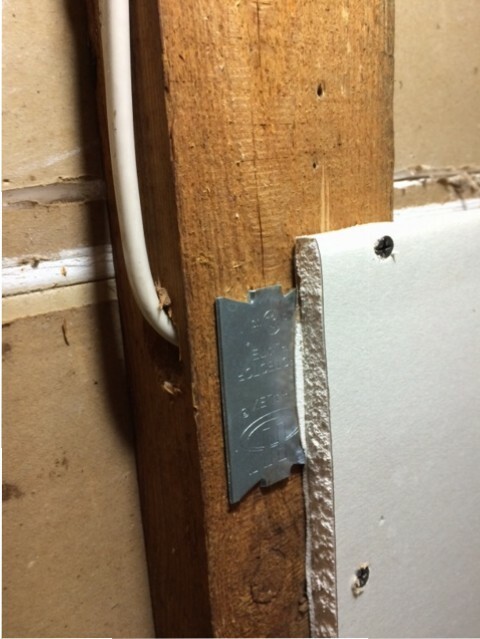 We just stapled the tabs to the stud on each side, and the insulation was installed. We installed insulation along the outer wall only up to the point that we intend to finish at this time. We will install the rest after I have run the wiring for the new outlets and lights. You can see some of the old yellow insulation from the stairwell above in this picture. Next, it was time to install the drywall. 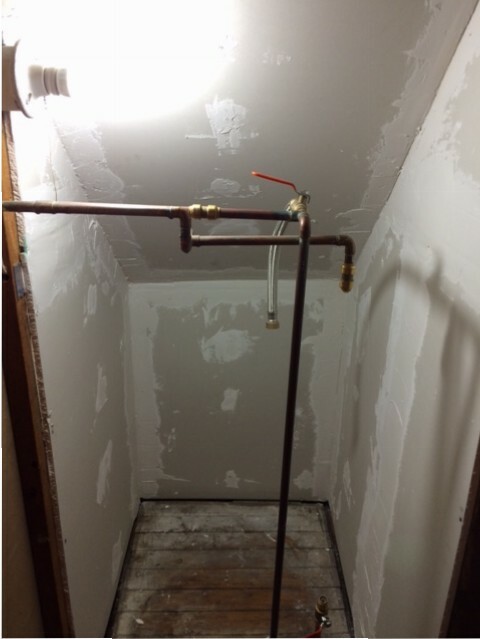 I took measurements of the sloped portion of the ceiling and the walls. 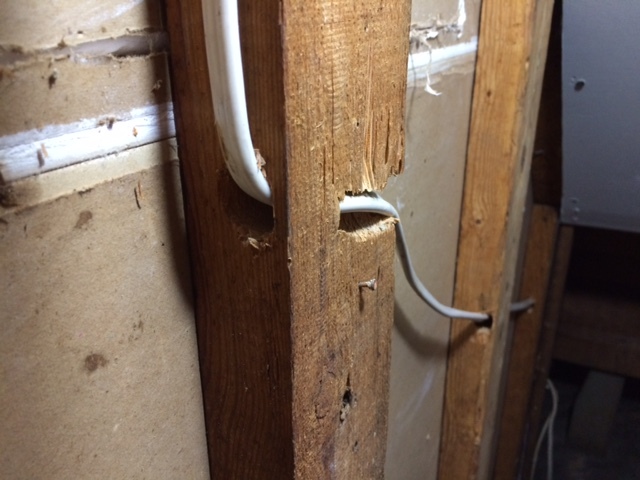 During the demo, I had managed to remove a section of the the wall with very little damage. 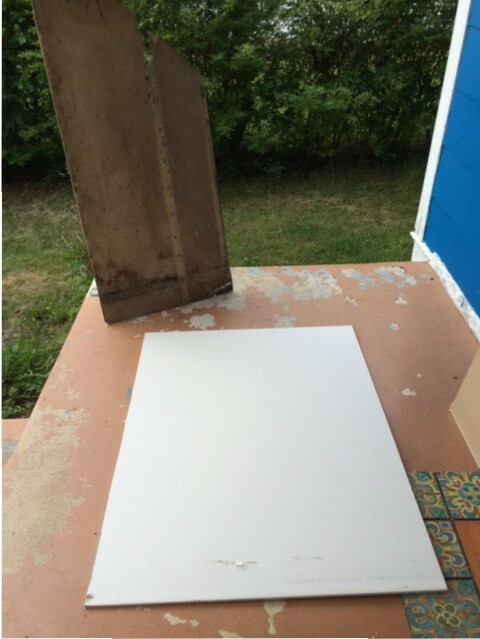 I used that as a template for the oddly shaped pieces for the sides of the closet. 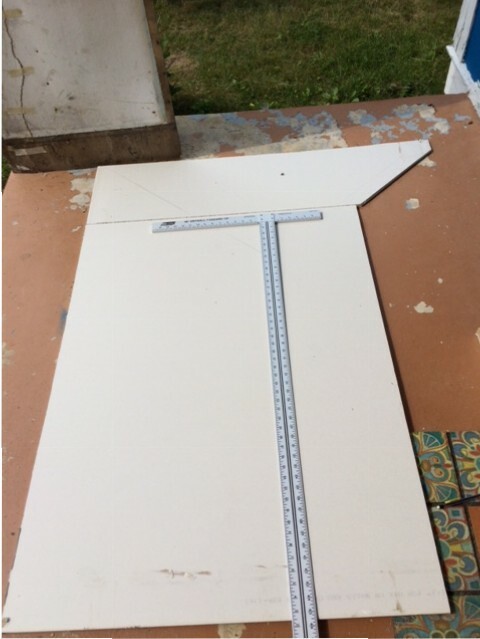 Then, I employed my awesome new drywall T-square for the actual cutting. This is where things got tricky. In spite of multiple measurements, we still hand difficulty getting a good fit. I finally figured out what the problem was though. There is a gap between the ceiling joists and the wall studs of about an inch and a half, but only on one side! Once we made some adjustments, we were able to make it work with the pieces that we had already cut, though there were several larger-than-desirable gaps between the pieces. The hardest part was actually attaching the drywall. 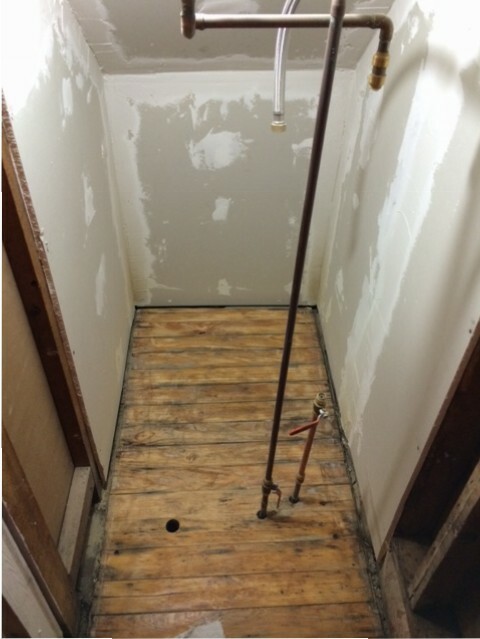 It was nearly impossible to drive the drywall screws into the 100-year-old studs. I exhausted myself on the first few, and Steve had to step in. Even with his strength, he couldn’t get some of the screws in far enough to set properly in the drywall. We finally gave up for the day in frustration. The next day, fortified by breakfast at Dunkin’ Donuts, we hit the Home Depot and procured a box of drywall nails, as well as fiberglass drywall seam tape, a sanding sponge, and paint. Once home, I went through and removed the drywall screws that had not set properly (most of them), and replaced them with nails. I tried to leave as many screws as I could, particularly in the ceiling. 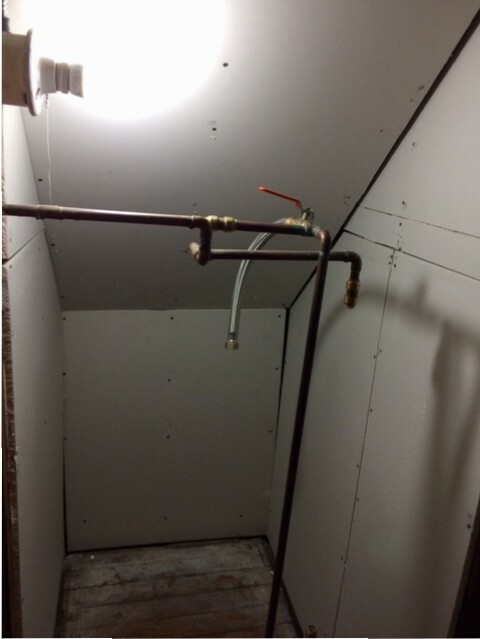 In the end, most of the screws and nails were set correctly in the drywall, and we were ready to move on to spackling. 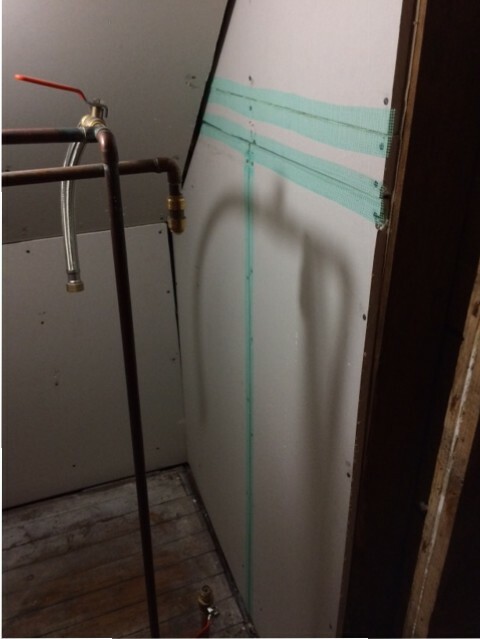 First, I taped the straight seams with fiberglass drywall seam tape. Also, note the presence of the installed nail plates over the previously very not-up-to-code wiring. Now, I was ready to get messy. I popped open my giant tub of drywall joint compound, only to find that it had gone bad, I guess? It hadn’t dried out, it had just separated and become really runny, more the consistency of paint than joint compound. So I heaved it into the garbage while Steve ran out to Home Depot yet again for a fresh tub. Finally, armed with fresh joint compound, I paper taped and mudded all the corners, and applied compound to the taped straight seams, and nail and screw heads. I really had to slather it on in places, particularly in some of the wider gaps in the corners. But in the end, all the holes were covered and the gaps were filled. I hoping that my mad sanding skills will turn my drywall mud pies into nice smooth joints. The last task for the day (such a long day!) 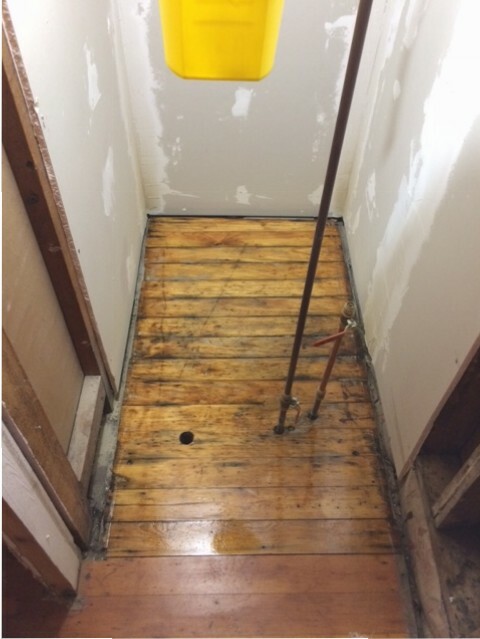 was to sand down the icky floor in the back part of the closet. It took quite a while and I went through several sanding pads with my orbital sander, but I finally got most of the paint and gunk off the floor. Then, I applied a coat of Minwax Fast-Drying Polyurethane, and left it to dry overnight. It was at this point that I realized that I had failed to tape off the sanding area behind plastic, and that a thin layer of sanding dust had covered everything in the living room. Steve was nice enough to vacuum up, and I helped him dust as best we could. Hopefully, when the whole thing is over, we can do a more thorough cleaning. I allowed the polyurethane to dry overnight, and applied a second coat Tuesday morning. 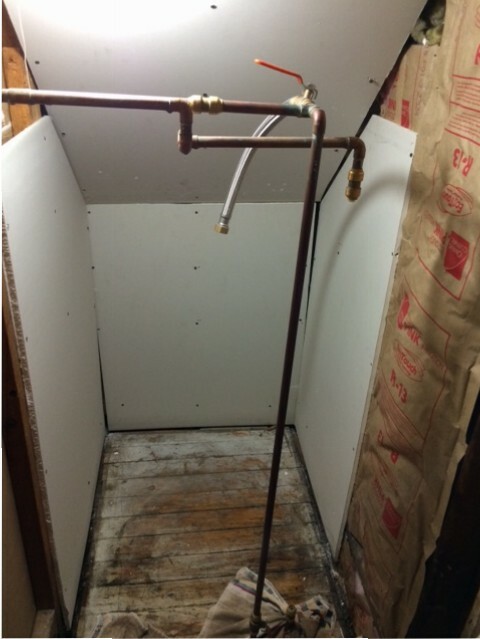 It has to cure for 24 hours before light traffic, and 72 hours before reinstalling furniture, in this case the water heater. That means, no hot showers until at least Friday. Ugh! Today, Wednesday, I am relaxing, allowing the poly to dry. Tomorrow, I will sand down the first coat of spackle and apply the second. Hopefully, I can sand down that coat, paint, and install the trim on Friday, and we can get our hot water back. It’s just as well, since I am exhausted from our down-and-back trip to Atlanta yesterday to see Rush in concert on their R40 tour (whoohoo!). This is the closest venue that they were playing, and even though we had to drive 5 hours in end-of-the-world type thunderstorms, it was TOTALLY worth it. 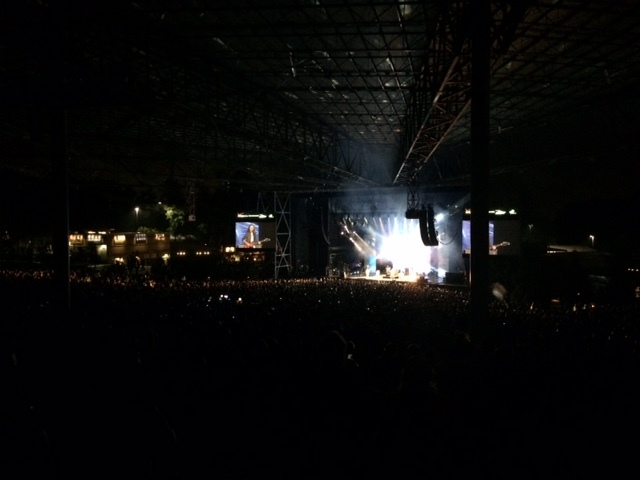 The weather cleared up just before the concert started, and it was a beautiful night. The show transcended every expectation, and I am still trying to return to reality.